Ilena and I will be exhibiting in REUNION an Alumni Invitational – the 20th Anniversary Celebration from February 18th to March 18th, at the McDonough Museum of Art in Youngstown, Ohio. The Museum notes they “invited over 60 faculty-recommended Department of Art Alums, a selection of our most impressive success stories, to be a part of this special exhibition. The participants range from recent graduates to those from 1970 and represent a broad range of disciplines.” I’m already excited about Ed Hallahan’s (www.edhallahan.com) work in the show and we’re considering a weekend venture back into the rustbelt. 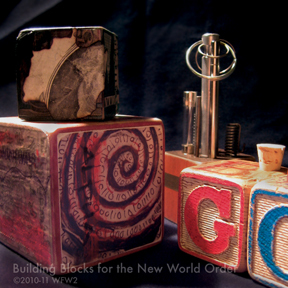 A new group of small works is being completed for this exhibition entitled Building Blocks for the New World Order. This series is part of my multi-part de(vice) works and a contemporary riff on antique toy blocks (aka building blocks, building bricks, alphabet nursery blocks, etc.) dating back to the 1600’s in Europe and to the 600’s in Asia. Interestingly beyond the simple attention and imagination that children of all ages/cultures have with building blocks, they have been found to hold physical, social, intellectual and creative benefits with use. Combining mixed-media application and manipulation, with a narrative exploring a new world order, the blocks will be fun, intriguing and mysterious. An alchemy: part toy – part tool – part relic. This entry was posted in de(vice) Series, Oakwilde, Sculpture. Bookmark the permalink.